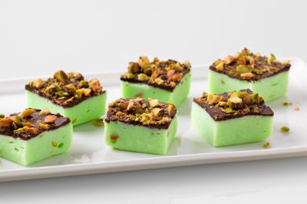 You don't need a big bag of pistachios to make these chocolate-covered fudge bites; they get their distinctive color from pistachio-flavor pudding. Prepare as directed, using JELL-O Banana Cream Flavor Instant Pudding and substituting chopped banana chips for the pistachios. Store cut-up fudge between sheets of waxed paper in airtight container in refrigerator up to 2 weeks.